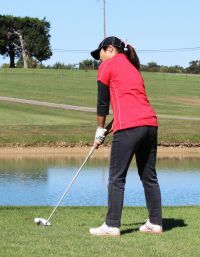 Sun Jung has been one of the top golfers in the state from the moment she first stepped foot inside Glendale High School in the fall of 2011. She has more medals than she knows what to do with. Jung has multiple All-State finishes at the two-day state tournament. And now Sun Jung has a state championship to add to her collection. 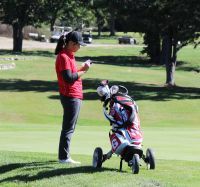 After finishing the first day of competition tied for the lead with a 4-over 76, Jung shot a 74 on a windy and cold second day of competition to finish with a two-day total of 150 at Meadow Lakes Acres Country Club in New Bloomfield, holding off second-place Taylor BeDell of Warrensburg by two strokes. After finishing as the state runner-up as a freshman, Jung was poised to capture a state title last season. However, a disappointing first day last fall resulted in Jung finishing six strokes back in 5th-place. That was good for another All-State honor, but it was not a state title. Therefore, it was important for Jung to get off to a strong start on the first day at State this year after having to overcome large deficits the past two years. As a freshman, Jung stood eight strokes out of the lead, and seven strokes back after day one as a sophomore. And compete Jung did, as she battled through the cold, moist and windy conditions to hold off the hard-charging BeDell, who was Jung’s only serious threat on the second day. Jung punctuated her round by lofting her tee shot on the uphill par-3 17th hole pin high to the left of the green. Facing a tricky 18-foot (through six feet of fringe) downhill putt with quite a bit of right-to-left break, Jung calmly dropped it in the center of the cup for a birdie. “That birdie putt gave me the confidence to finish strong,” said Jung. “I always had a rough first day every state tournament I played. But this tournament was different. I did have a rough start on the front nine, but something clicked and I started to play better. Jung’s play on day two, as well as her strong finish to the round, was a testament to her mental make-up. It was also a sign that she had learned from previous state tournaments. When the day two scores had been tallied, it became clear that Sun Jung was the Class 2 state champion. It was a tremendous accomplishment, and one for which her coach was very proud. Jung, who is originally from South Korea, has been playing golf for the past ten years. She had a good teacher early on in her brother, Hong, who is now a professional teacher for the PGA. 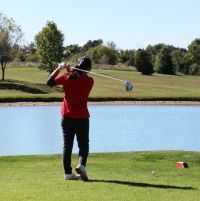 Jung announced her arrival on the prep golf scene in the fall of 2011 by earning medalist honors at the Missouri State Relays, the Jim Pearson Invitational, and the Ozark Conference tournament. She capped her season with a state runner-up finish. Jung has compiled an impressive resume to this point. 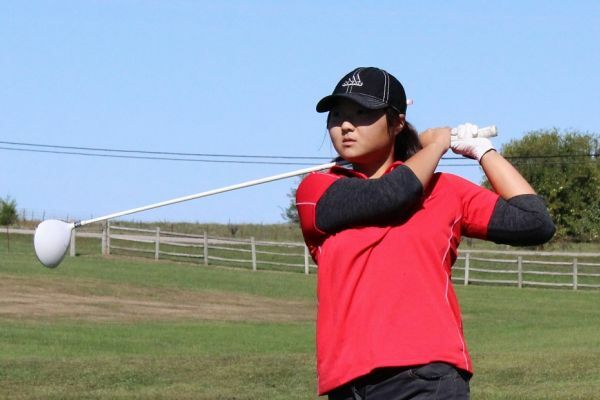 In addition to winning a state title and being a three-time All-State golfer, Jung has also won or shared three district titles and a pair of Sectional medalist awards. These accolades are in addition to the many regular season tournaments and matches that she has won. A famous golf quote, which has been attributed primarily to Jack Nicklaus, states that, “the game of golf is 90 percent mental and 10 percent physical.” Regardless of who first said it, it remains true that a golfer’s mental make-up is as important—or more important—than how far he or she can hit the ball. Jung’s mental approach is just one reason why she is such a strong golfer. She also has been blessed with the physical attributes, too. Jung is now chasing history, as she has the opportunity next year to become just Springfield Public School’s fourth four-time state medalist, and the first since Glendale’s Anne Cain and Kickapoo’s Kim Hedgpeth went head-to-head from 1982-85. Glendale’s Vickie Reynolds was a four-time medalist from 1976-79. Jung also has a chance to match Cain and Reynolds with two individual state championships. Reynolds actually tied for top honors in both 1978 and 1979, but lost a one-hole playoff both years. However, she is listed in the MSHSAA record books as a winner of multiple state titles. One thing is certain, though. Sun Jung is a state champion, but next fall as a senior, she will be just as hungry to win a second one. Originally published in the November 2013 issue of Ozark Preps Illustrated.